Headstones, urns, photographic and other memorials for your pets who have crossed the Bridge. Wonderful poetry, and information on euthanasia, grieving, and explaining death to children. North of the Bridge is the place where huskies will meet us. A beautiful story by Andre DeMerchant that has changed the way I look at the Northern Lights. Randy Fischel maintains this tribute to those waiting for us on the other side of the bridge. A beautiful memorial to a young Siberian taken from his loving family by cancer. Have your hankie handy when you read this tribute to a beautiful and mischievous puppy. A poem for Mary Ann's boy begins "my jake - defiant, destructive, so gentle and sweet..."
Memories of a loving Siberian whose life was cut short by cancer. Crossing the Bridge just before her 16th birthday, she left memories of a spirit that we would all be proud to possess. 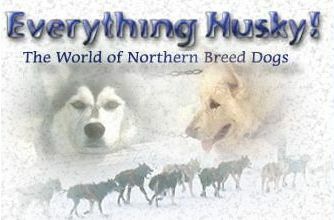 My tribute to the Siberian who was the inspiration for building "Everything Husky!" Kiba, a wolf-Malamute cross, was the Wolf Packs company's original mascot. A memorial to the trail dog who was the reason the Wolf Packs company began. "One Adventure Ends, Another Begins" - Kodi, the ultimate adventurer, crossed the bridge, and Monty arrived to help heal the broken hearts. This beautiful Siberian puppy is gone, but is still loved by her family. A loving tribute to Tasha, a Siberian Husky puppy, by Carolyn White. Martie Barth looks back at life with this beautiful girl who crossed the bridge in 2001. Bruce Johnson's lead dog was a super-dog, but lost his life to a pack of wolves near Atlin, British Columbia in 1985. This loving memorial shows the bond that can form between a woman and a Siberian after over 13 years.